WASHINGTON -- From one former White House resident to the newest one - Chelsea Clinton has a message for the world regarding the latest first kid. 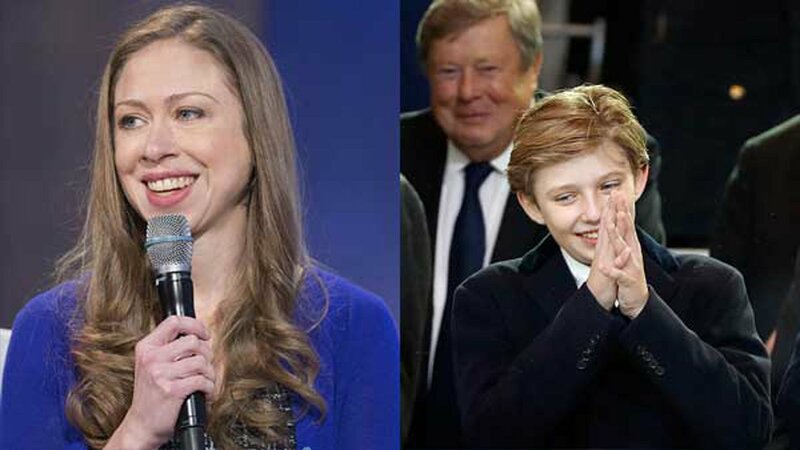 "Barron Trump deserves the chance every child does - to be a kid," Clinton wrote on her Facebook and Twitter accounts Sunday. Aside from defending President Donald Trump's youngest son, Clinton also took the opportunity to fire shots at the new president. "Standing up for every kid also means opposing POTUS policies that hurt kids," Clinton wrote in the same post. Barbara Bush and Jenna Bush Hager, George W. Bush's daughters, wrote a letter to Sasha and Malia Obama about transitioning out of life in the White House during the last week former President Barack Obama was in office. "Now you are about to join another rarified club, one of former First Children - a position you didn't seek and one with no guidelines," the letter said. "But you have so much to look forward to. You will be writing the story of your lives, beyond the shadow of your famous parents, yet you will always carry with you the experiences of the past eight years."